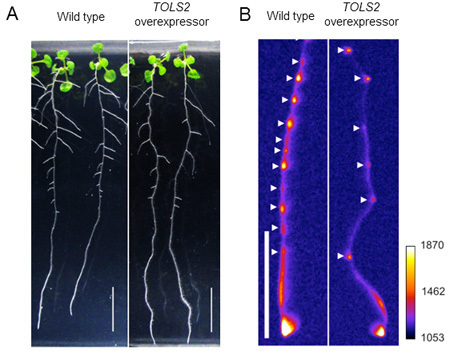 Overexpression of TOLS2 gene decreases the number of lateral root founder cells and later roots. A: Arabidopsis wild-type (left) and TOLS2 overexpression type (right). 10-day growth. Scale is 1 cm.B: The expression of DR5:LUC gene in the roots of Arabidopsis wild-type (left) and TOLS2 overexpressor (right). White arrows indicate lateral root founder cells. The scale is 1 cm. (January 18, 2019) — How do plants space out their roots? A Japanese research team has identified a peptide and its receptor that help lateral roots to grow with the right spacing. The findings were published on December 20, 2018 in the online edition of Developmental Cell. The team was led by Professor Hidehiro Fukaki (Graduate School of Science, Kobe University), Researcher Koichi Toyokura (currently JSPS Research Fellow at Osaka University) and Project Assistant Professor Tatsuaki Goh (currently Assistant Professor at the Nara Institute of Science and Technology) in collaboration with Professor Yoshikatsu Matsubayashi and Assistant Professor Hidefumi Shinohara (both from Nagoya University) and other researchers from the Nara Institute of Science and Technology, Associated Professor Koichi Fujimoto (Osaka University) and Assistant Professor Yuki Kondo (the University of Tokyo). Plant root systems are mainly shaped by the lateral roots that grow from tissue inside the existing roots. These roots form from “lateral root founder cells” that are positioned at regularly-spaced intervals at a distance from the meristem tissue (tissue responsible for growth). Previous studies using Arabidopsis plants showed that lateral root founder cells are made from sites where there is high response to the chemical auxin, and indicated that transcription factor LBD16 induced by auxin may inhibit the cells near lateral root founder cells from forming roots. This time a joint research team, using plant modelArabidopsis, searched for the gene that is activated by transcription factor LBD16 and successfully identified the TOLS2 gene. The TOLS2 gene is mainly expressed in lateral root founder cells and root germs. InArabidopsisplants that overexpress TOLS2, the number of lateral roots decreases (figure 1), indicating that the TOLS2 gene can inhibit the formation of lateral root founder cells. The team analyzed secretions from plants with overexpression of TOLS2 and revealed that the mature TOLS2 peptide is formed from 11 amino acids. When they artificially created mature TOLS2 peptide and added it to a wild-typeArabidopsis, the number of lateral root founder cells and lateral roots decreased (figure 2). Based on further investigation, the research team identified the receptor for TOLS2 as RLK7. RLK7 proteins express in the inner sheath of the roots (where the lateral root founder cells are located), the endodermis and the dermal layer, but RLK7 expression could not be found in the lateral root founder cells. It is likely that these proteins suppress the formation of lateral roots in cells adjacent to lateral root founder cells. Next, using CRISPR/Cas9 genome editing technology, the team investigated how lateral roots form in other genetically-altered plant samples. Their results confirmed that the TOLS2 peptide and the RLK7 receptor are necessary to preserve the correct spacing between lateral root founder cells. From this analysis the research team proposed that Arabidopsis, by responding to auxin and inducing TOLS2 peptide in lateral root founder cells, through RLK7 receptors inhibits nearby lateral root founder cells in a non-cell-autonomous manner (figure 3).